Titus is a huge fan of chicken - in general, and of the legs in particular. The first time he ate them was at a preschool picnic, and the teachers all commented that he had eaten more than any other kid OR the adults, when I picked him up. He's not that enthusiastic all the time, but he sure enjoys his chicken legs. And us parents, we enjoy these ones in particular. They're really easy to make, and they have great flavor. Based on a recipe from my blogging friend Annika, who blogs in Swedish. Well worth a visit! Mix all ingredients for the marinade, and mix with the chicken. You need a pretty big bowl. Leave at least an hour, and stir a few times during that hour to make sure the legs are all well marinated. Place the legs on a rack on top of a baking sheet (ideally covered with foil, if you don't love cleaning), and brush with some of the marinade. Bake at 200°C for 10 minutes. 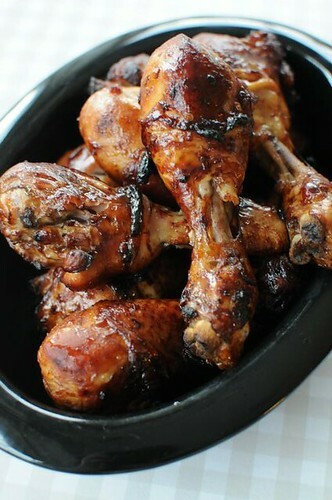 Turn the legs over, brush with more marinade, and bake for another 10 minutes. Check to see that they're cooked through - if not, add a few more minutes of cooking time. As always, I have a convection oven. You might have to adjust times and perhaps temperature, to suit your own oven. I've been meaning to try that recipe as well, they look sooo good! Hi, nice recipe. I have the same,but i put 2 or 3 things more. Honey + lemon + oyster sauce + Ricard. I let the chicken one night in the marinade. Perfect creole recipe from island of Reunion ( indian ocean ).